Winter wheat acres across WI have declined over the past few years due to late grain harvests, disease concerns (FHB or scab) and poor wheat prices, however anyone that lives and works in WI knows that a base number of cereal acres are needed to support the dairy industry (straw and land to summer haul manure). 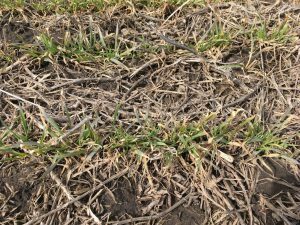 As farmers get ready to kick off the 2019 growing season here are a few suggestions to help get your 2019/20 winter wheat crop established on time. Plant early. If weather and soil conditions allow for it plant the acreage you intend to go to winter wheat first. This is regardless of which crop you plan to follow (soybean, corn silage or field corn). Remember the optimal planting date window for most of our WI winter wheat acres is the last week of September through the first week in October. In table 1 below you will notice that for every 3 days soybean planting is delayed we see ~1 day delay in beginning maturity (R7), so delaying planting by one week equates to about 2 days later maturing. However when planting is delaying past June 1st it turns in to more of a 1: 1 relationship. Also remember in WI it normally takes another 5-8 days for the soybean crop to move from R7 to R8 (full maturity). Table 1. Calendar date for reaching R5 (beginning seed fill) and R7 (beginning maturity) growth stage by planting date and maturity group for the 2014, 2015, and 2016 growing seasons at Arlington and Hancock, WI. Consider an earlier maturity group soybean. Plant a high yielding, earlier maturity group soybean to help get that soybean crop harvested on time. Though later maturing varieties “on-average” produce the greatest yields, data from our 2018 WI Soybean Variety Test Results show the maturity group range that included a starred variety (starred varieties do not differ from the highest yield variety in that test) was 2.1-2.9, 1.8-2.4, and 1.8-2.0 in our southern, central and north central regions respectively. This suggests that the “relative” maturity group rating is trumped by individual cultivar genetic yield potential. Therefore growers have options to plant an early maturity group soybean that will be harvested on time and not sacrifice yield. Crop rotation matters. Our long-term rotation data suggests winter wheat yields are greatest following soybean then followed by corn silage and lastly corn for grain. Therefore plan your rotation accordingly to maximize yield and system efficiency. Manage for the system not necessarily the crop. If you are serious about maximizing wheat grain and straw yield on your farm one of the biggest contributing factors for both of these in WI is timely wheat planting. Make management decisions to facilitate that. *We all know what inputs can extend soybean maturity that don’t necessarily guarantee greater yields. So instead of listing them and fielding angry emails I am being strategically vague here* In a recent study I would note that across years and environments we did quantify a %RYC (percent relative yield change) swing of -4.1% to 11.2% among various soybean inputs so balance that against a loss of 10-20 bushels of wheat grain yield and 0.5 tons of straw? As we all know mother nature holds the ultimate trump card on whether we will get our winter wheat crop established in that optimal window. These aforementioned strategies are relatively low risk to the farmer and regardless of what weather patterns we run into are agronomically sound. 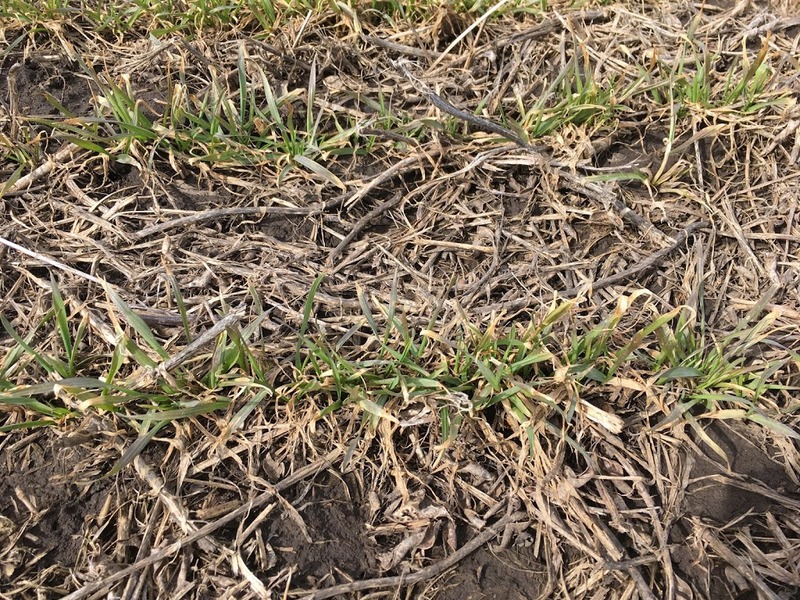 As we begin to contemplate spring and the 2019 winter wheat growing season, many growers and consultants alike are beginning to venture out and across their winter wheat fields to assess winter injury and nitrogen timings. 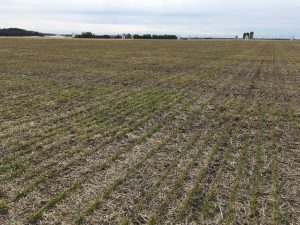 Though it is a bit premature to make any rash decisions regarding crop destruction here are a few considerations for assessing your spring 2019 winter wheat stands. As you look across your wheat landscape vibrant green patches will be interspersed with drab brown areas. The brown areas do not necessarily indicate those plants are dead. Growers and consultants can either reassess in a week or pull plants from the field and place in warm environments. Milk houses and kitchens work perfect. Root regrowth will appear from the crown and will appear as vibrant white roots as shown below. If plants do not recover our critical threshold for turning over a field is 12 to 15 live plants per square foot. Below this threshold (< 12 plants per square foot) is an automatic replant decision. In regards to N application timing for winter wheat that decision is pretty darn simple. Research from Dr. Carrie Laboski’s program indicates that the optimal time to apply nitrogen to wheat in WI is green-up regardless of tiller count. 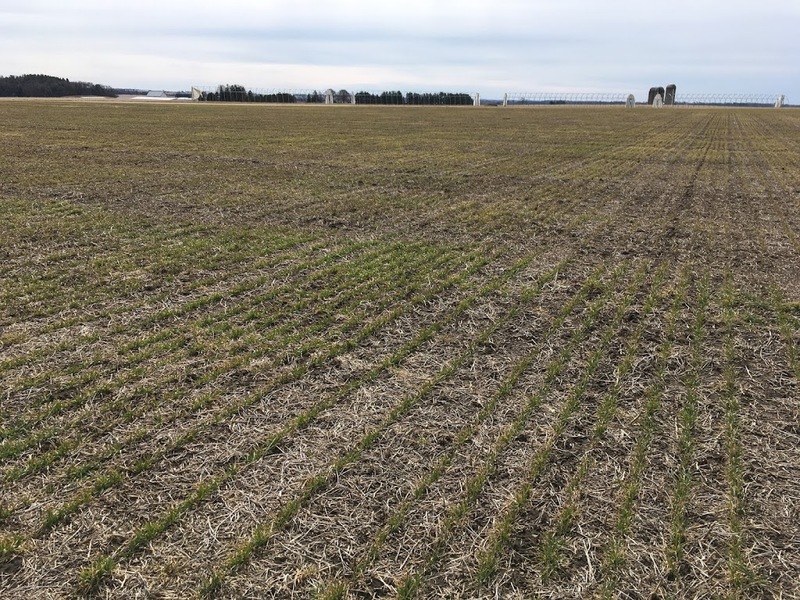 For more detailed information check out her blog article here: Time your spring nitrogen applications to maximize winter wheat yield. Also remember that wheat grain in itself is only part of the revenue you capture with winter wheat. The price of winter wheat straw remains strong and roughly ~11% less acres of winter wheat were established last fall than the previous year (2017/18). Please consider that revenue stream before any replant decisions are made. The WI Soybean Marketing Board (WSMB) sponsors free nematode testing to help producers stay ahead of the most important nematode pest of soybean, the soybean cyst nematode (SCN). Eggs of SCN persist in the soil between soybean crops so a sample can be submitted any time that is convenient. The soil test report indicates the number of eggs in the sample and is useful for selecting the right variety for the next soybean crop. 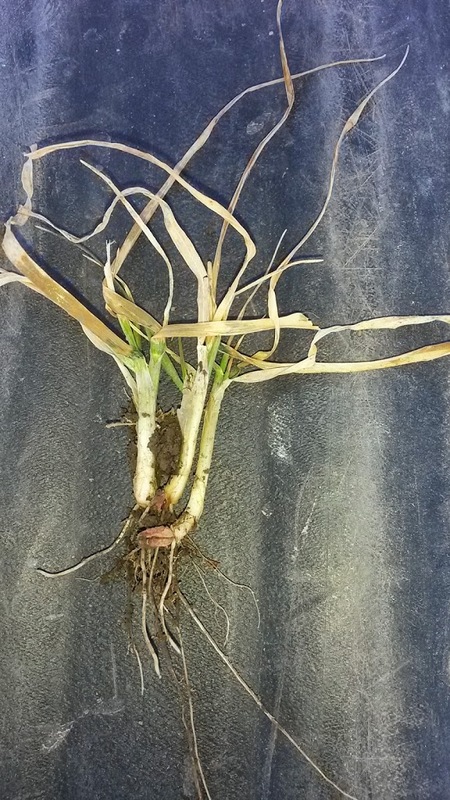 Retests of fields planted with SCN-resistant varieties over multiple years shows how the nematode population is responding to variety resistance and provides an early warning should the nematode population adapt to host genetics. In the spring of 2012, the WSMB expanded the nematode testing program to include other pest nematodes in addition to SCN. These nematodes are less damaging to soybean than SCN but can cause enough yield loss to warrant treatment. As is the case for SCN, there are no rescue treatments for nematodes so the primary purpose of this year’s soil test is to plan for next year’s crop. Soil samples collected in corn for nematode analysis have predictive value for explaining yield if they are collected before the corn V6 growth stage. Sampling early in the season will provide information about the risk potential for the current corn crop AND the next soybean crop. The assays used to recover nematode pests other than SCN in soil require that the nematodes are alive. So, it is important to keep the samples moist and at least room temperature cool. Collecting a sample that includes multiple cores ensures that there will be plenty of root pieces to assay. It is not necessary to include live plants in the sample. The soil test report will indicate which pest nematodes are present and at what quantities and their damage potential to soybean and corn based on the numbers recovered. For more information on SCN testing and management practices or to request a free soil sample test kits please contact: Jillene Fisch at (freescntest@mailplus.wisc.edu) or at 608-262-1390. Click to view more information on our WI SCN testing program or visit The SCN Coalition. 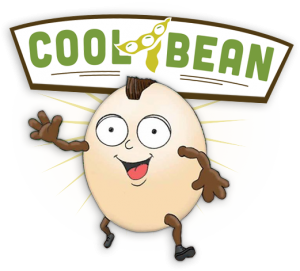 https://coolbean.info/wp-content/uploads/sites/3/2019/04/2018_SCN-Map-WI.jpg 1056 816 shawnc /wp-content/uploads/sites/3/2017/10/coolbean.png shawnc2019-04-01 09:56:302019-04-01 09:58:21The WSMB Free Soybean Cyst Nematode Testing Program is Back in 2019! The 1st place winner in Division 4, Riley Bros Farms of Darlington, grew Asgrow AG2636 and harvested 99.58 bu/a. In second place, Venable Farms Inc. of Janesville grew Jung 1243R2X and harvested 93.22 bu/a. In Division 3, Jim Salentine of Luxemburg harvested 79.32 bu/a with Steyer 1401L and in 2nd place, Oeh My Farms of Abbotsford harvested 77.90 bu/a with Credenz CZ 1028LL. In Division 2, Custer Farms of Chippewa Falls achieved 72.67 bu/a from Asgrow AG19X8 for first place. In 2nd place, Adam Majeske of Balsam Lake harvested 56.64 bu/a from Asgrow AG17X8 soybeans. No entries were submitted for Division 1. Kreuziger Grain Farms of Juneau was the winner of the Soybean Quality contest with 2,737 pounds of protein plus oil per acre from Pioneer P22T41R2. The contest is sponsored by the WI Soybean Program and organized to encourage the development of new and innovative management practices and to show the importance of using sound cultural practices in WI soybean production. The final ranking and awards will be presented at the Corn Soy Expo to be held at the Kalahari Convention Center, Wisconsin Dells on Thursday January 31st during the WSA/WSMB annual meeting. The contest is sponsored by the WI Soybean Program and organized to encourage the development of new and innovative soybean management practices as well as show the importance of using sound cultural practices in WI soybean production. The weather outlook does not look promising for any soybeans getting harvested over the next few weeks. 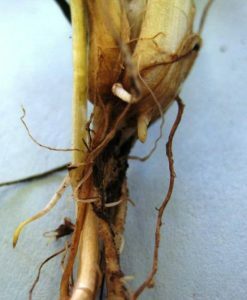 This reality has many growers concerned about soybean sprouting in the pod. Fortunately this is not a common concern for northern soybean farmers but may be a problem in 2018. Given my lack of experience on this topic I leaned on a few of my southern colleagues for thoughts and advice on this topic. Dr. William Wiebold, Professor of Agronomy in the Division of Plant Science at the University of Missouri provides very detailed and excellent information regarding the mechanisms of sprouting in soybean in this article entitled: Wet Weather Can Cause Seeds to Sprout on the Plant. Lets just hope the weather forecast is wrong and WI soybean farmers start rolling in their soybean fields like Bucky will roll over Nebraska this Saturday! Go Bucky!!! https://coolbean.info/wp-content/uploads/sites/3/2018/10/sprouting_soybeans.jpg 2016 1512 shawnc /wp-content/uploads/sites/3/2017/10/coolbean.png shawnc2018-10-02 13:33:102018-10-02 13:33:10Crappy Prices Followed by Crappy Harvest Weather...These Beans Better Not Sprout Too! Drought Stricken Soybeans..Should I Leave Them or Take Them for Forage? Late soybean plantings followed by dry conditions have some northern WI growers considering chopping their soybean as a forage. Before you even consider this option make sure you check the label of the pesticides applied to the crop before you grease the chopper. Let’s start with the herbicides first. In short, outside of glyphosate (25 day) and a handful of pre’s and posts (please refer to Table 3-3 in A3646, Pest Management is WI Field Crops) most soybean herbicides are listed as “not permitted” for forage use. Next, many common insecticides used for soybean aphid management implicitly state “Do NOT graze or feed treated forage or straw to livestock” (please refer to A3646, Pest Management is WI Field Crops) . Lastly, fungicide labels are as equally exclusive with pre-harvest intervals ranging from 14 days to “Do NOT graze or feed soybean forage or hay” (please refer to A3646, Pest Management is WI Field Crops) . If you somehow pass the gauntlet of “Do not” or “Not Permitted” and the forage value is greater than the grain value then the highest protein and yields are obtained from soybean harvested at the R6 to R7 growth stage. Harvesting soybeans for forage between the R1 and R5 stage will result in a very high quality silage, but dry matter yields will be reduced significantly. Forage quality will be reduced from R5 soybean forward if a conditioning process is used during harvest as conditioning will cause significant seed shattering. Here are some options for you to consider to help think through the forage versus grain decision. What is my realistic tonnage expectations? Late planted drought stricken soybean will yield ~1 to 2 tons of dry matter per acre. What is it going to cost me to harvest and put this crop up? How should I price this crop? If you were to price the soybean forage based on expected grain yield and CBOT then realistic yield levels would range from 15 – 25 bu per acre at $7.95 per bu (local cash price: 8/22/18). Expected forage value range would be $119.25 to $198.75 per acre. I am tired of throwing money at this crop………. Though you will save on harvest costs the average cost of a plow down disk operation is $19.70 per acre. How much will I save on next years fertilizer bill? By not harvesting the crop you will not remove the 30# P and 85# K (estimated removal rates of P2O5 and K2O for 15-25 bu per acre soybean grain and straw (A2809)). You may contribute 20-40 pounds of N to next years corn or wheat crop. Neither of these prove to be particularly attractive options. However I would encourage growers, crop consultants, and nutritionists to weigh the true economical value of each option carefully before proceeding. /wp-content/uploads/sites/3/2017/10/coolbean.png 0 0 shawnc /wp-content/uploads/sites/3/2017/10/coolbean.png shawnc2018-08-22 14:38:042018-08-22 14:38:04Drought Stricken Soybeans..Should I Leave Them or Take Them for Forage? For many of us in agriculture, 2017 was a year we would like to quickly forget. Unpredictable weather, low crop prices and last, but certainly not least, many of us were dealing with the D-word, and I don’t mean Dallas. Off-target movement of synthetic auxin herbicides pitted neighbor against neighbor, farmers against state boards and industry against academia. The caustic environment in agriculture in 2017 made the politics in Washington D.C. look like Sesame Street! On October 30th 2017 Dr. Kevin Bradley published A Final Report on Dicamba-injured Soybean Acres where he listed an official count of 2,708 reported cases of dicamba-related investigations and an estimated 3.6 million acres of dicamba injured soybean. The efforts of Dr. Bradley as well as many other Extension Weed Scientists led to wholesale changes in herbicide labels and mandatory training prior to the 2018 growing season. The collective hope was to keep these herbicides on-site, where we put them! This spring, Mother Nature gave many growers across the Midwest small windows to plant soybean in April and early May. Planters got ahead of spray rigs, pre-emergent herbicides didn’t get out and boom, we are behind the 8-ball for weed control options. Those early planted soybean acres then decided to bloom in June which put applicators and farmers against the clock to get their post emergence herbicides on according to label. In the Midwest, it has rained for the past week and applicators have been challenged again to get into the field. Later planted soybeans will start to bloom over the next week and again put applicators and farmers running against the clock to get their post emergent herbicides on consistent with label directions. If dicamba was applied post emergence, we can simply mark our calendar forward 14-21 days, cross our fingers and hope that the label changes, applicator training, and more recognition of the potential problems worked and we don’t see any off-site injury. Let’s fast forward to now. The first official unoffical report of crop damage due to dicamba injury was reported by Dr. Bradley today “Dicamba Injured Crops and Plants Becoming More Evident: June 15th Update”. We are also starting to see images and early reports of dicamba injury coming from the Mid-South and lower mid-western states. It would be irresponsible to make any wide sweeping claims of pending doom; however, if it does show up it would be even more irresponsible to not report it. I am in a drought stricken area and if I report any damage I will be ineligible for crop insurance! This is my neighbor, we are friends and I don’t want the government involved. We can handle this between us. We need this technology and I don’t want to lose it! As a farm kid myself, I fully understand all of the reasons mentioned above. However, we must all be cognizant that just because we don’t report a problem doesn’t make it go away. There are far too many recent examples of institutional non-reporting that have come back to severely damage the reputation of the non-reporting entity (MSU, Face Book, #MeToo, etc.). Our institution is agriculture! We battle misinformation on GMO’s, we battle misinformation on animal husbandry, and we constantly battle educating the other 99% on what we do. If 2018 turns out like 2017 we do not want to stick our heads in the sand and pretend a problem does not exit. If 2018 turns out to have minimal issues then FANTASTIC! Industry and academia should be lauded for their joint accomplishments. The best way to support agriculture and freedom to operate is through honesty and accurate self-reporting.